INWOOD — Two frozen yogurt shops are set to open within a block of each other on Broadway. The first of the two stores, VSBerry, is set to open at 4971 Broadway at Isham Street and will hold a grand opening celebration on Sat, Aug. 31. Just one block north at 4996 Broadway at 212th Street, Dolce Vida Frozen Yogurt has placed "coming soon" signs on its windows. VSBerry is the latest effort by Salma Lopez, the owner of Inwood's Yummy Thai restaurant. The shop — located in the old AN Shell Realty building — will feature up to 12 flavors of self-serve frozen yogurt along with 100 toppings. While Upper West Siders complain about the myriad of frozen yogurt stores in their nabe, Lopez, who is opening the store with uptowner Victor Sidberry, said that she's long wanted bring a froyo store to Inwood. "I've been thinking about doing this for two years," said Lopez, 28. "I thought that this was something that the area needed." In addition to yogurt, the store will sell candy, coffee and soft pretzels in cinnamon, almond, chocolate chip and original flavors. "The concept is really different," Lopez said. "We're putting all these things together that no one else has, so I think that's our signature." 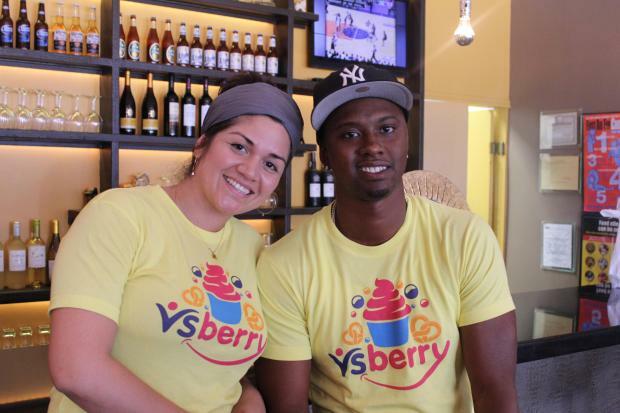 VSBerry will be kid-friendly, the owners said, as the shop will have a colorful yogurt-cup mascot named Barry. Also, the shop's opening day will feature face-painting for children. Lopez, mother to a 4-year-old daughter, said that eventually the goal is to have some sort of promotion every weekend. If the Inwood location is a success, Lopez, 28, and Sidberry said they're open to the idea of expanding to other locations uptown. "We're planning to stay on Broadway and cover the part that's missing this," said Lopez.